The Rubber Man - Cursed To First - Sox and Pats forever. 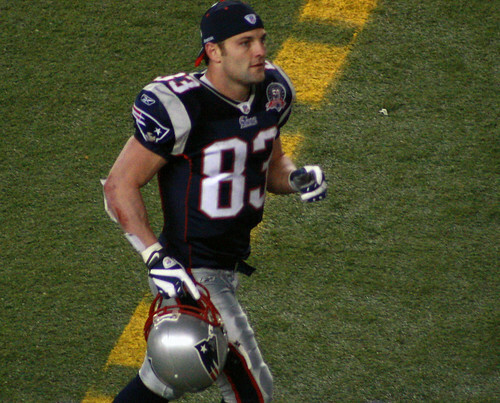 Wes Welker: great slot receiver, or greatest slot receiver? 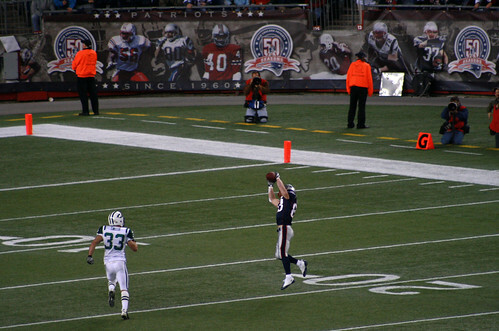 Last time the Patriots played the Jets, Wes Welker was not active for the game. This time, he was the team's leading receiver. One game was a loss. The other, Sunday's decisive win. You can't say Wes Welker singlehandedly made the difference in this game (Leigh Bodden and his three interceptions might have something to say about that). But he came about as close as you can in as team-oriented a sport as football. My father and I were sitting on the second deck near the lighthouse in the North end zone, and so whenever the action came close to that end of the field we had an up-close view. During the second quarter, with the Patriots driving from their own territory in front of us, Brady hit Welker with a pass that made my dad's eyes pop behind his binoculars. Lowering them, he hollered, "Did you SEE THAT?" It's not a play that will make any of the highlight reels; the play was short of a first down and was an otherwise forgettable three-yard pitch and catch. But "pitch" would be an appropriate word for it -- it had all the humming speed of a major leaguer's fastball, down and away, spiraling toward the ground as if fired from a cannon. Welker reached out with his hands of iron and stopped that missile with his fingertips just before it hit the ground. Then he curled up like a beetle hiding behind its carapace, as he always does, and let the defensive onslaught pile on top of him. When the dust cleared, he popped up and headed back to the huddle, ready to line up for his next diving self-sacrifice. After the nuclear holocaust: cockroaches and Wes Welker. Not only can he seemingly catch anything, but the man comes across as literally impervious to the worst punishment a defense can throw at him. He takes smashing, ringing hits and pops up again just as he did after that play. Maybe it's because he's so small, and can curl up like that at the end of plays, letting the blows rain down on his back while he compacts his frame to protect himself. When you actually attend a game, ironically, you see less of it. Sometimes you miss the subtleties as the game moves 90 yards away in the opposite end zone from where you're sitting, as binoculars or a telephoto lens are the closest you're going to get to the action, and it seems completely random when the stadium will choose to show a slow-motion instant replay on the Jumbo Tron. Without Joe Buck or the like to fill us in, I had no idea that Welker was setting personal best records during these individual plays, in which he had 15 catches for 192 yards. But there was no question, even as we contended with drunks and spilling beer and squinting at the action downfield, that Welker was the standout player of this game. There was one play in the third quarter where the consensus around us was that Brady may have been trying to throw the ball away toward the right sideline, and still Welker snagged it. You'd have to be blind, blackout inebriated or not in your seat not to see his impact on this game. What I find even more interesting in retrospect isn't just the huge receiving numbers Welker put up: it's another number next to his name in the box score. Zero touchdowns. In baseball, we would call this kind of thankless yeoman's work being a dirt dog. Personally I think Moss and Welker are apples and oranges, but it's for the best that way. Welker's not usually going to win on a jump-ball, but Moss isn't going to take the kind of beating Welker routinely takes going over the middle. Welker's all about yards after catch; Moss is all about the circus reception in the end zone to put things to rest immediately. 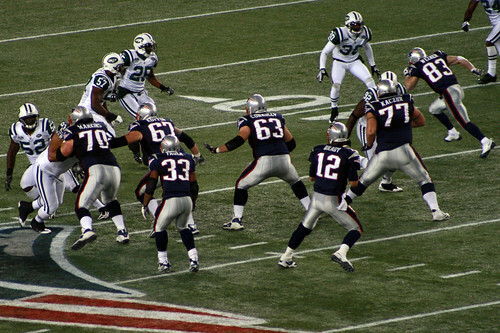 I think the Patriots' biggest advantage comes not from having one or the other, but having both players on the team, and being able to alter game plans to focus on one or the other depending on opponent, or even check plays at the line based on the defense. 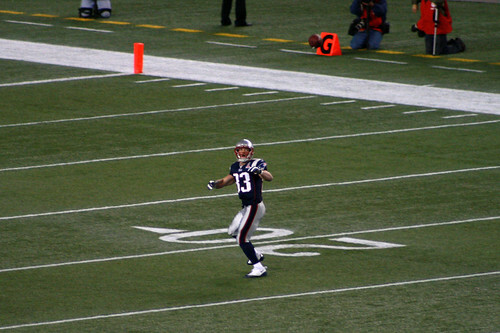 To return to the baseball analogy again, one is Brady's fastball (Moss) and the other his curveball (Welker). One might play a bigger role than the other in a particular start, but both need to be established against the other.